COREY FRASER goes to Fort Erie with his pick up mount GALLANT and wins the biggest race of his career. • It was not a sizzling fast renewal of the PRINCE OF WALES STAKES but it was a very exciting finish as the recent maiden winner GALLANT, at 15 to 1 ding donged to the wire with MILWAUKEE APPEAL, the no-give-up filly, and both held off the slow charging Eye of the Leopard, the Plate winner. GALLANT won the photo after judges looked at it a while. To most observers, MILWAUKEE APPEAL looked like the winner on the bob but the photo showed a teeny weeny loss for the CEC Farms filly. Anticipation – trainer SCOTT FAIRLIE’S son appears to be praying that the filly MILWAUKEE APPEAL won the prince of Wales while in the background, Corey Fraser on GALLANT talks with Ricky Griffith. NORM FILES PHOTO.. The time of 1:56.74 yielded an 86 Beyer Figure, down from the 92 that was put up in the Plate. Woodford Racing took it’s biggest win since starting its Canadian syndicate three years ago. Under Bill Farish Jr. the group of owners often come to Woodbine to watch their horses race. They have had starts such as Legal Move and others. 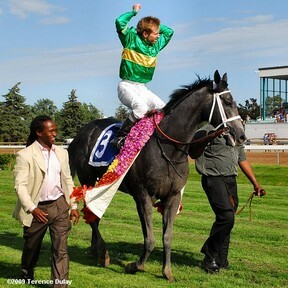 Its trainer, MARK CASSE, was not at Fort Erie for the Wales – neither was Gallant’s main rider Patrick Husbands. Instead, assistant Rick Griffith and likeable jockey COREY FRASER celebrated a well deserved win. YESSSSSSSSSSSS – Corey Fraser and a super ride on Gallant was the winning ticket in the 74th Prince of Wales. Terence Dulay photo. It has been known as a graveyard of favourites, and yesterday Fort Erie racetrack confirmed its reputation when 15-1 shot Gallant won the 74th Prince of Wales Stakes, the second jewel of Canada’s Triple Crown. The steel grey 3-year-old, trained by champion trainer Mark Casse for the American syndicate Woodford Racing, had bypassed the Queen’s Plate but had enough to hold off determined filly Milwaukee Appeal and Plate winner Eye of the Leopard in a wild finish to the 1 3/16 mile Canadian classic. The margin of victory was officially a nose, but it was closer to the width of a dime that gave Gallant the $300,000 winner’s share of the $500,000 purse over Milwaukee Appeal. “When we were galloping out (after the race) I looked over at Milwaukee Appeal and (jockey) Stewart Elliott and I thought, `Oh no, did I lose? '” said jockey Corey Fraser, scoring the biggest win of his riding career. 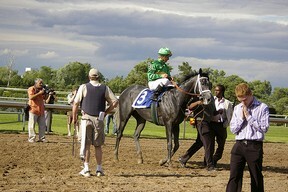 Fraser, who grew up not far from Fort Erie in Wellandport, was demonstrative in his excitement at emerging victorious. “I’m speechless,” the 32-year-old said. It was high drama in Fort Erie Sunday as Niagara Falls jockey Corey Fraser rode a horse named Gallant to an upset, photo-finish win during the 74th running of the Prince of Wales Stakes. Fraser’s victory dashed the Triple Crown hopes of heavily-favoured Eye of the Leopard, who won the Queen’s Plate three weeks ago. After the race, it took several minutes for racing officials to sort out which horse was the winner. Fraser, 32, wasn’t even sure himself. “I thought I won it, but I tried not to think (about) it too much in case that was just a jinx or whatever,” said Fraser, still trying to catch his breath after the surprise win. “When it was taking a long time for the photo, I was thinking it was a dead heat, and I was going to be just as happy with that.” Ultimately, the camera showed Gallant, at 15-1 odds, had nosed out filly Milwaukee Appeal in the 1 1 /2-furlong dirt-course run. Eye of the Leopard, the Queen’s Plate winner and the second choice at 9-5, was prominent early but lost ground down the backstretch before rallying to end just a half-length behind the top pair in third place. “I never wanted to leave that No. 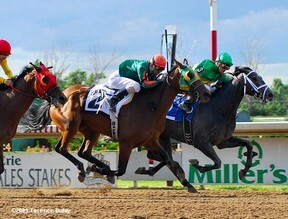 2 horse alone,” said jockey Eurico Rosa da Silva, refererring to Milwaukee Appeal. “When I tried to get close, my horse didn’t respond. I had to start all over again. His champion mare ARRAVALE might be retired from the track but Bob Costigan is still making noise in the racing industry. Costigan is the breeder of GALLANT and sold the colt as a yearling for just over $90,000 US at the local sale. I bred Quintessa to Aptitude because I was trying to get an athlete that could run long. Aptitude of course won the Belmont and so did Quintessa’s sire Touch Gold so Gallant should run all day. I also liked the fact that Aptitude was out of a Northern Dancer mare. So the Northern Dancer cross worked from my point of view through a daughter and a son on the Dam’s side. That was the reasoning I was looking to breed a Queens Plate type. Its nice to see it working out so well. Quintessa is a daughter of the local stakes winning mare ONE MORE BREEZE and from the family of champion HOPE FOR A BREEZE, a long line of horses bred and raced by Stan Dodson. 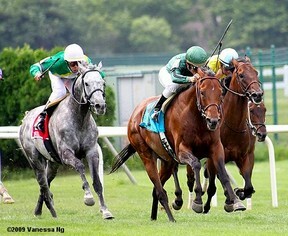 In the Grade 1 MAN O’ WAR STAKES at Belmont on Saturday, GIO PONTI confirmed he’s the best turf male in the east (middle horse) while the ROGER ATTFIELD trained MUSKATIER (grey guy) was a super 2nd. VANESSA NG PHOTO. If Ed Olczyk keeps pocketing cash on the ponies like he did a few weeks ago, he’ll be able to buy the Phoenix Coyotes and bring them back to Winnipeg himself. The former Jets forward is back in town for the inaugural Winnipeg Sun Lee Goren and Friends Autism Invitational golf tournament, which will take place tomorrow at Niakwa Country Club and raise funds for autism research. Olczyk, who is the lead analyst for NBC’s hockey broadcasts, came back a day early, however, to visit his good friends at Assiniboia Downs and impart some wisdom during an hour-long panel discussion called Horses & Hockey. The event, which took place just prior to last night’s racing, attracted several dozen bettors and hockey fans. And they should have listened to Olczyk’s betting story just as much as his hockey tales, because it appears he knows what he’s doing. How could I get picks from Vanessa Ng? ?